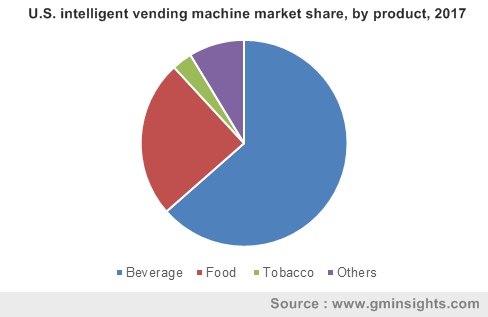 Intelligent Vending Machine Market size was valued at over USD 11 billion in 2017 and will grow at a CAGR of over 15% from 2018 to 2024. The global shipments are expected to exceed 5.5 million units by 2024. Increased adoption of interactive technologies in various application areas is driving the intelligent vending machine market growth. Several manufacturers are introducing online vending machines that allow customers to purchase items over the internet. These machines provide customers with internet connectivity and allow the online purchase of products through smartphone applications. In the coming years, such interactive solutions will attract more customers to stores that shop using such machines. Several manufacturers in the market are integrating these machines with cashless payment technologies. For instance, otiMetry is offering a modular solution to add the functionality of cashless payments to beverage vending machines. Moreover, with the rising security concerns in these dispensing machines, intelligent vending machine market manufacturers are incorporating biometric technologies. It allows customers to access the machine through facial or fingerprint identification. The biometric machine helps store owners to protect their products from theft and robbery. Manufacturers are continuously working on developing such advanced vending solutions. For instance, in June 2017, American Green introduced biometric machines that will dispense the products based on the age parameter of individuals. These systems are widely used for selling age-restricted products such as cigarettes and alcohol. Furthermore, some manufacturers in the market are also working on incorporating the iris recognition technology into these systems to enhance the security of these machines. In 2017, food-based machines accounted for over 25% of the intelligent vending machine market share and are witnessing extensive adoption in several application areas. The machine helps to store food products in a fresh environment to protect it from being attacked by several bacteria and micro-organisms. These machines are developed with smart technologies that adjust the internal environment based on products that are stored in it. The products include fruits, snacks, chocolates, and cookies, among others. These types of machines are experiencing high adoption in retail & restaurant outlets owing to their ability to serve customers with fresh offerings. Such advanced features are driving the application areas of these machines, thereby providing an impetus to the market growth. Several bakery and fast food products need hot environments for serving fresh food to their customers. Hot vending machines enable fast food stores to maintain such environments. The increasing customer crowd in food outlets is encouraging store owners to install automated technologies for serving their products in an effective manner. Automated dispensing machines help the restaurant staff to reduce the waiting time and offer food products through vending channels, thereby allowing them to serve customers fast. Several players in the market are engaged in catering to such customer requirements by offering advanced machines that are specifically designed for hot & cold items. The intelligent vending machine market is witnessing rapid adoption of these solutions in offices/institutions. The segment is anticipated to expand at a CAGR of over 12% from 2018 to 2024. Corporate sectors are adopting advanced technologies for providing fresh, healthy, and light refreshments to their employees. Snack and chocolate dispensing machines are experiencing high adoption rates in these sectors. Coffee vending machines, also known as Office Coffee Service (OCS), are the most widely used machines in offices. They have low maintenance costs and are user-friendly, encouraging various corporate sectors to adopt such smart solutions. Moreover, smart technologies that are being integrated into these machines will help offices to keep a track of orders and employees dispensing the products. The biometric identification feature will help employees to log in with their ID cards and dispense products, thereby improving the safety and security of the machine. It will also allow managers to analyze and monitor the break times with through biometric login details of the employee in such advanced machines. A rise in the incorporation of such modern technologies at workplaces will drive the market. North America intelligent vending machine market is witnessing high growth due to a rise in the demand for self- service technologies at retail outlets to automate the sales process. Retail outlets in the U.S. and Canada have been witnessing rapid adoption of these systems across several application areas including supermarkets, retail stores, shopping malls, etc. Technological advancements and innovations in these systems aid in automating the business processes in their application segments. Moreover, favorable initiatives and the demand for enhanced customer experience will drive the regional market growth. Growing tourism in the countries including the UAE, Saudi Arabia, and South Africa has led to a large number of infrastructure development projects in these regions to match with the latest technology solutions and trends. These include developments in the design and retrofitting of stores with machines to match the needs of consumers. 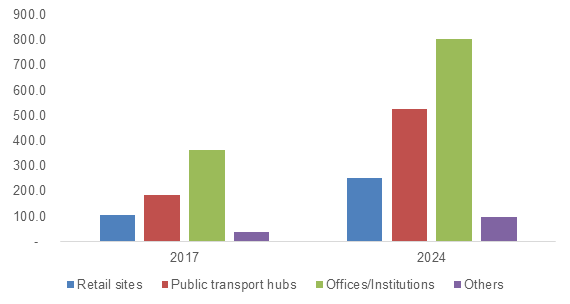 The demand for enhancing the passenger experience at places of travel including airports and railway & metro stations will also favorably impact the market growth in the MEA region. Key players operating in the market are Azkoyen Vending Systems, American Vending Machines, Bulk Vending Systems, Automated Merchandising Systems, Evoka Group, Bianchi Industry SpA, Crane Merchandising Systems, Continental Vending, Inc., Sanden Holdings Corporation, and Fuji Electric Co., Ltd., among others. These players are engaged in developing advanced solutions by integrating modern technologies, such as mobile payments, card readers, and QR code scanner, to simplify the payment process and enhance the shopping experience of customers. Intelligent vending machine market manufacturers are also involved in developing industry-specific solutions that can satisfy the requirement of customers with advanced features and functions. For instance, Azkoyen Group is offering several products that can be used for vending hot beverages, cigarettes, cold drinks, etc., to offices & businesses, transport & leisure facilities, healthcare, education & public facilities, and hotels, restaurants, and bars. Various companies in the market are also offering several maintenance & installation services to clients operating in these application segments. 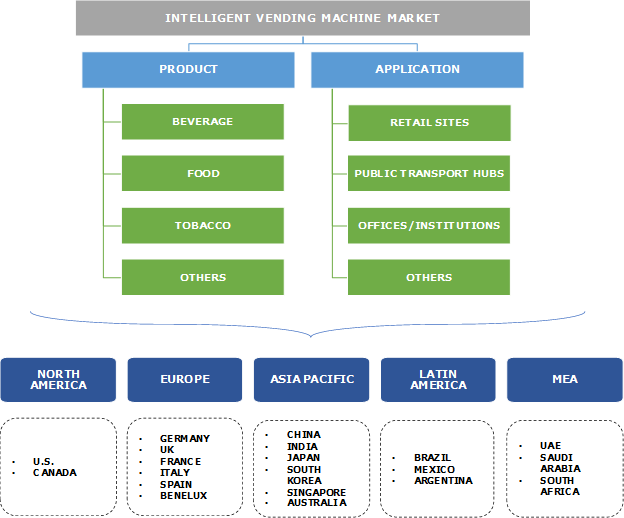 The intelligent vending machine market is witnessing a high growth owing to the rising adoption of smart solutions for automating the sales process in several application segments. These machines are witnessing popularity owing to the consumer satisfaction they offer. High transaction speeds and accuracy offered by these machines are encouraging store owners to adopt these smart solutions. Store owners are concerned about the safety & security of their products in these machines. Manufacturers in the industry are incorporating advanced technologies for enhancing the safety of these machines and the products that they contain. To achieve this, they use smart sensors, personal alert systems, customer tracking & detection, and remote monitoring & tracking. Technology providers in the market are developing solutions that can be integrated into the machine to offer advanced features such as cashless payment solutions, machine learning, and IoT connectivity. These players are incorporating connected solutions within machines that help in gaining real-time customer & transactional data. The applications of these machines in public transport hubs are expected to grow over the coming years owing to the growing need for automated technologies to offer food products to passengers at airports, bus stands, and railway stations. Such factors are anticipated to positively impact the market growth.